As a member of Toastmasters International, I am available for and enjoy public speaking. In addition to the programs listed below, I have served as keynote speaker, presenter, and storyteller covering a wide range of topics and events for all ages. I’ve traveled nationwide as a keynote speaker at educational conferences, book talks, and writing workshops. Read some testimonials about my visits. This presentation is very similar to a storytelling event. The true story behind A Letter to Mrs. Roosevelt is brought to life. Members of the audience become active participants in the presentation. 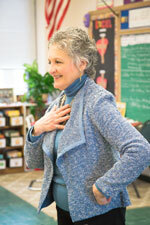 A question/​answer session follows the book talk. 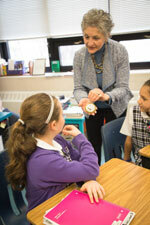 Still a teacher at heart, I have enjoyed presenting writing workshops to educators, and students in Grades 2 through 12. Below is a description of four presentations; three for students and one for educators. I have also had the pleasure of addressing librarians, parents and fellow authors as keynote speaker and other speaking engagements. If you are interested in a workshop presentation or speaking engagement and would like to know the fees involved, please email me. PLEASE NOTE: It is customary for students to be familiar with an author’s work prior to a visit. All workshops and presentations listed below are more effective when students have either read or heard A Letter to Mrs. Roosevelt prior to my arrival. Thank you. 20 minutes for a background look at the true story behind A Letter to Mrs. Roosevelt; 40 to 45 minutes of the writing workshop; remaining 20 to 25 minutes for questions and answers. To assist students in methods designed to improve their writing skills; and provide a fun, educational step-by-step process of developing characters for the young writer’s stories. This writing workshop is designed to solve the mystery of character development in a story. Most appropriate for students in Grades 3 through 6, this presentation has also been adapted for and successfully presented in Grades 2 through 8. Students will arrive at the workshop having read A Letter to Mrs. Roosevelt, as that work will be used for discussion and comparison. Throughout this workshop students will focus on an outline which will help them to recognize the basics necessary to develop a strong, believable character. Open discussion will encourage and facilitate the development of a particular character which the class as a whole may recognize as its own. Emphasis will be placed on the search for clues that “flesh out” a character’s personality and inherent traits. Students will rapidly progress through stages which provide the character with a setting, dialogue, and action. This workshop may be used as a stand alone presentation, or in conjunction with a follow-up, THAT’S A WRAP WATSON! The Detective Work of a Good Story. To assist students in methods which will improve the student’s writing skills, and provide a fun, educational, step by step process of developing the young writer’s understanding of what constitutes a well-written story. This writing workshop is separate from, but a continuation of “MAKE WAY, SHERLOCK! How to Nab Your Main Character.” It is most appropriate for students in Grades 3 to 6, and can be adapted to the needs of more sophisticated writers in Grades 7 to 9. Students will arrive in the workshop with a previously written story, with the understanding that these stories will be openly critiqued and improved upon throughout the course of the workshop. Emphasis will be placed upon methods to improve the key elements of story writing such as characterization, dialogue, plot, setting, etc. This workshop can be presented over single class periods in one day, where the work of several students is openly critiqued. If presented over the period of several days, all students will be divided into critique groups, taught the methods and responsibilities of critiquing the written work of another student while improving upon their own. To instruct students in the ways and means of completing research relevant to one’s writing. Students will be directed in the process of sifting through extraneous information to find what is most useful to his/​her story. This writing workshop is most appropriate for the student in Grades 5 through 12. Students are directed through the steps of acquiring information and materials relevant to their writing. Emphasis is placed upon how to “siphon through” their research and determine what will help a story, fiction or nonfiction, to move forward in an interesting manner. Students will develop an understanding of how to weave facts and information into a story without slowing down the momentum of a story for the reader. Some discussion will encompass the use of all the “extra” information students may acquire, and how it may be used for other writing purposes. To instruct educators in methods relevant to bringing a story alive within the realm of the classroom. A step-by-step process will demonstrate ways to enhance the comprehension skills of the student, and to live vicariously through the minds of the characters they meet in a book. This presentation has been developed solely for the educator. One of three separate lessons will be used to demonstrate a step-by step process which can engage students in the dramatization of an author’s work. The efforts of those attending this seminar will be employed in a fun and constructive manner in order to demonstrate classroom technique. As I write, I often find myself in the realm of nonfiction, dusting off long-forgotten books and files to peruse the crumbling yellowed pages for key bits of information. These facts are woven into the pages of my books, or detailed in presentations as the “ah-ha” moment that stroked the imagination. As an author and public speaker, I have two goals: to utilize my experience as an author and former educator for the benefit of readers and aspiring writers of all ages; while also honoring the art of writing. 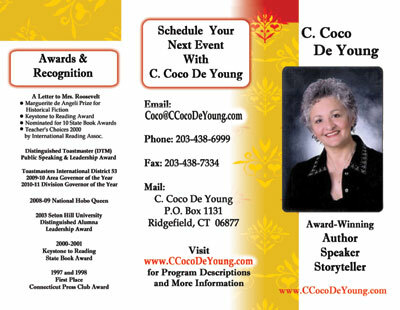 Nationwide invitations as a keynote speaker at educational conferences, book talks, and writing workshops are especially gratifying. More importantly, these events grant me the opportunity to meet and speak with readers and aspiring writers of all ages, enabling us to connect on common ground.